Victorian winged bug sash pin created from embossed brass that has been gilded with gold. Embellished with sparkling brilliants. One blue brilliant on each wing and a pale pink brilliant on the body. These appear to be foil backed and do sparkly brilliantly. Extremely Fine condition with no damage or repairs. Item #10786 Price:$95.00 USD Tell me more! 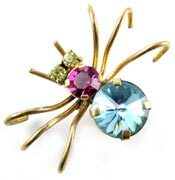 A very colorful little spider created from brass that has been set with exquisitely beautiful crystal rhinestones. Sapphire blue, magenta and pale yellow. Extremely Fine condition with no damage or repairs. Hallmarked, Made in Austria. Gift boxed. (The box is not vintage. Item # 10781 Price: SOLD $45 USD Tell me more! Beguiling blue bug. 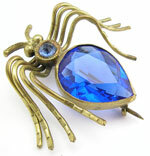 Her thorax is a pale sapphire blue rhinestone and the abdomen is a deep, almost cobalt blue piece of faceted glass. All metal parts are created from brass that has been gold washed. The antennae and legs are stamped with a pattern. Extremely Fine condition. Older C type clasp. Not signed. Item # 10713 Price: SOLD Tell me more! A ruby red bug with curly legs. The abdomen, thorax, and head are created from molded glass that is a transparent deep ruby red. The accents on its body and its curly legs are created from gold washed brass. EXtremely Fine condition. Older C type clasp. Not signed. Item #10712 Price:$89 USD Tell me more! What elegant wings this bug has. The legs and wings are created from gold washed brass. The abdomen and thorax are yellow satin glass cabochons that are swirled with varying shades of yellow. Prong set with very elegantly detailed brass prongs. The eyes are sparkling amber glass. Extremely Fine condition. Signed, Czechoslovakia. Older C type clasp. Item # 10734 Price: $125 USD Tell me more! A delightfully whimsical fish by Hattie Carnegie. 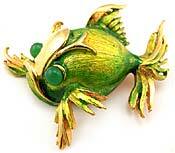 Its eyes are large green plastic cabochons and its body is gold toned metal and green enamel. Extremely Fine condition. Hallmarked Hattie Carnegie. Item #10526 Price: $125 USD Tell me more! Exquisitely graceful!! This beautifully designed dancer is perfectly proportioned. Created from sterling silver by Danecraft. Item #10226 Price: SOLD $55 USD Tell me more! Big, beautiful brooch! Comprised of rhinestones that sparkle in hues of amber and smokey topaz. The stones are prong set in coppery gold-toned metal. Signed 'Weiss'. Item # 10408 Price: $75 USD Tell me more! Oh Christmas tree, Christmas tree, what a beauty you are. Comprised of gold toned metal and prong set glass rhinestones. Extremely Fine condition with no damage, repairs or replaced stones.Hallmarked, WEISS. Item # 10637 Price: $125 USD Tell me more! A rare jeweled snail!! Comprised of gold-toned metal. His shell is encrusted with blue and green glass cabochons. The tips of his antennae are sparkling rhinestones. Textured body. Marked 'Hattie Carnegie'. Item # 10402 Price: SOLD $125 USD Tell me more!